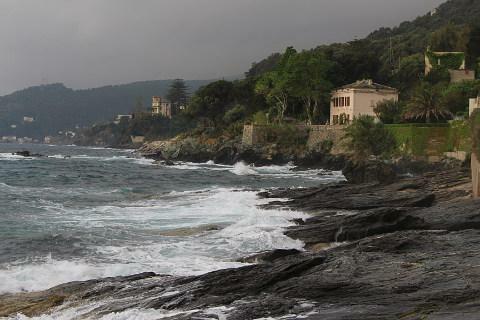 Erbalunga is a fishing village situated about half way along the eastern coast of Cap Corse, to the north of Bastia. 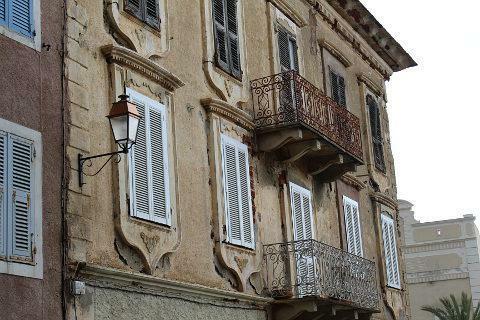 The village now gives little clue that it was once the major port town in north-east Corsica. 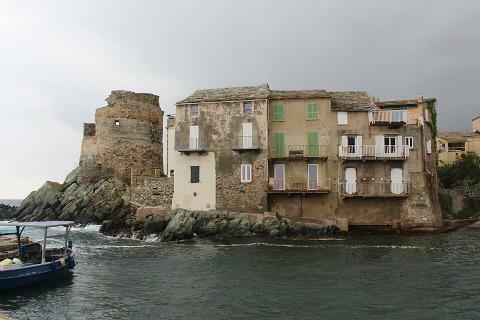 The village consists of a small huddle of houses squeezed scenically onto a rock peninsula jutting into the sea, with a ruined Genoese tower - a listed historic monument - standing guard at the end of the village. Or if not standing guard any longer, then providing numerous photo opportunities! 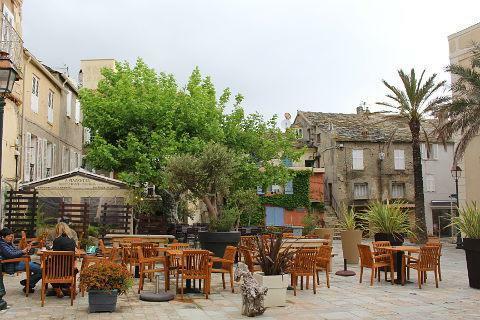 Although small the village itself is a pleasure to explore, with traditional village houses lining the ancient streets, narrow alleys and passageways that make up Erbalunga. The narrow alleys have decorative crazy-paved floors and are lined with cacti, succulents and deliciously scented jasmines. There are also a number of cafes and restaurants here to cater to visitors and locals alike. The facades of the buildings are rather grey and faded and looking ready for a fresh coat of paint - perhaps a little colour! Various paths lead onto rocks at the edge of the sea and there is also a small harbour, and a pebbly beach (beaches are unusual on the rock coastline of Cap Corse) running along the coast to the north of the village. The highlight in the Erbalunga calendar is on Good Friday, when the annual 'festivities' are held. With its history thought to date from a traditional fertility ceremony, there are a series of ceremonies and processions that take place during the day, in traditional costume and following the custom of 'bringing life back to the earth' after the winter months. 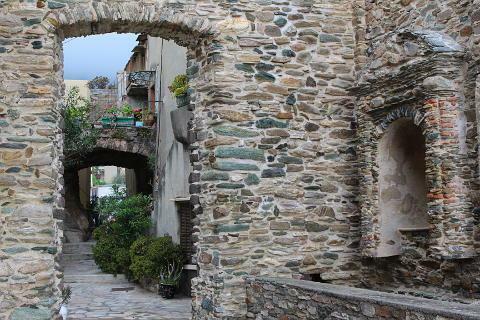 During the summer months a large number of concerts and art exhibitions are also held in Erbalunga. 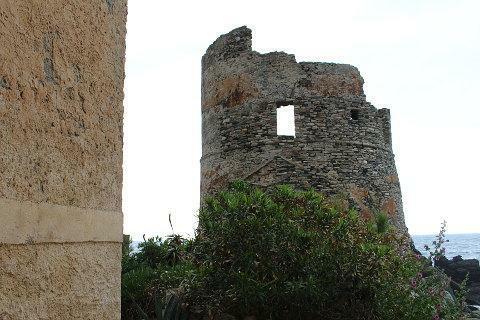 Another small village with a Genoese tower and a small pebble beach can be visited at Miomo, a few kilometres south of Erbalunga. Take a drive inland through the lovely maquis covered hills and you can see a ruined castle at Castello, 3km above Erbalunga. The castle is said to be haunted! Also nearby is an 11th century chapel, the Chapelle Notre Dame des Neiges which has some 14th century frescoes inside. Heading north a a larger sandy beach can be found a few kilometres north at Pietracorbara. There is also a marina and another Genoese tower. North of here is another Genoese tower called the Torre dell'Osso or 'tower of bones' after the human skeletons found around its base. 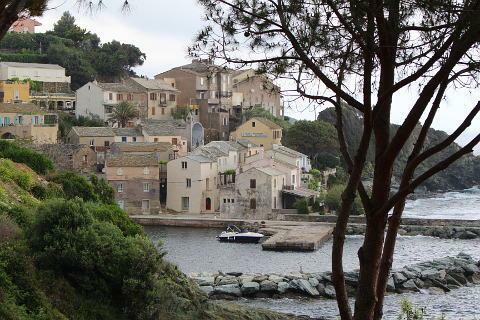 Porticciolo is a pleasant village with a small harbour and a sandy beach.